The Lean Six Sigma Green Belt and Black Belt certification is suitable for anyone looking to generate business improvements in areas such as: customer satisfaction, service delivery, cost control, process performance, & new product introduction. 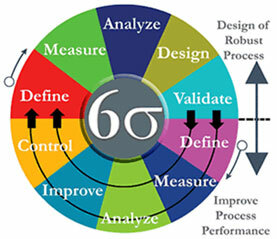 Lean Six Sigma is a process improvement methodology. Project and change management are ineffective without process management. Your combined Green Belt and Black Belt certification course is delivered by PEEC, an IASSC accredited Lean Six Sigma training provider, meaning you will benefit from accredited instructors and curriculum. You will be introduced to both Lean and Six Sigma methodologies, meaning that activities focused around the speed and quality of business processes are addressed. Lean Six Sigma is a process improvement methodology. Project and change management are ineffective without process management. You will use the approach to maximise customer value whilst minimising waste. In simple terms this is creating more value for customers with fewer resources. Your accelerated course meets the ISO 18404 standard applicable to all PEEC programs. Delivered in line with the International Standards for Lean Six Sigma, as described in the ISO 13053-1 and ISO 13053-2 standard, you will attain internationally recognised certifications in Lean Six Sigma Green Belt and Black Belt. Traditional Lean Six Sigma Black Belt training lasts 20 days. This normally includes a month between each module, meaning that it can take up to four months to complete. This is compared to ten days (Green + Black Belt) at Firebrand. Plus, our course contains case studies and exercises - it is not just theory. Understand Six Sigma and Lean and have hands-on application of the Green Belt tool-kit applied to real-life problems. Establish meaningful business metrics that align process performance with financial performance. Have a detailed view of Cycle Time Reduction, Process Variation and Risk Management. Prepare an actionable plan for identifying, scoping and chartering process improvement projects and selecting the right people to execute those projects. Lead teams in managing and preventing defects in products, processes or services. Redesigning exisiting products, processes or services to achieve Six Sigma levels of performance over the life cycle. Understand how an enhanced value stream can illuminate areas of opportunity through the application of Lean principles to reduce cycle time. Apply a practical understanding of how to lead strategic change, manage a team and transfer Lean Six Sigma knowledge to develop robust breakthrough products, services and processes that perform flawlessly on launch. Prepare an actionable plan for supporting your organisation, and tools to build continuous improvement capability that deliver substantial and meaningful business results. This Lean Six Sigma Green and Black Belt course is designed for all business professionals from a wide variety of manufacturing or service / transactional environments. Ideally, you will be tasked with delivering major performance or efficiency transformation for a business, typically working as a Change Leader within the business. ISO 18404 certified - delivered in line with the International Standards for Lean Six Sigma as described in the ISO 13053-1 and ISO 13053-2 standard, you will attain an internationally recognised certification as a Lean Six Sigma Green Belt. As part of the course you will sit both the Lean Six Sigma Green Belt and Lean Six Sigma Black Belt exams. These are multiple choice exams, which each require a 70% pass mark. You will walk away with proof that you are competent in process management and improvement. You will be taught more advanced customer requirement analysis methods, more advanced change and project management methods, as well as more advanced Six Sigma statistical measurement & analysis techniques. You will work on an in-class Case Study designed to simulate projects that typically take up to 6 months to solve at work. You will walk away with deep competencies in all 5 LEAN principles as well as extensive competencies in how to test improvement choices, and control process performance. You'll have at least one and a half years of project management experience, either directly as a Project Manager or as part of a team. You'll also have a basic understanding of Microsoft Office; such as Word, Excel, and PowerPoint. Previous exposure to process improvement or Six Sigma philosophies is helpful, but not essential. Just call us on +27 87 550 2195 and speak to one of our enrolment consultants. "I leave Firebrand Training with a Black Belt Six Sigma toolbox and detailed insight how to apply that toolbox in my work place." "The facilities and the materials were very conductive to learning at a controlled pace and understanding." "This has to be the most time effective way to learn - which I value a lot." "Michel was fantastic trainer/ facilities with a relaxed style which is required for such a heavy work load"
"good insights and feedback from the tutor throughout the case study"
"The focus & insight into Learn Six Sigma will leave you wanting to go back to work and start delivering products using really great tools"
"As with previous training an excellent format with trainers, good material and food." "Intense...Intense...Intense but boy do you really learn. Fantastic Experience"
"The instructor did a great job in covering the material and making it accessible and practical." "Intensive 10 days, where all phases of team development are tried. Tested and developed both hard and soft skills around Lean Six Sigma concepts that are truly valuable for broader application. Course leader was excellent in bringing real life, practical examples that assisted in the learning process." "The quickest way to get your certification." "Great teacher, has a wealth of knowledge and experience to make the classroom experience as near to reality as possible. Thank you." "Quickest way to get certified but don't underestimate the amount of work you need to do." "Highly intense, rewarding to fully focus on concept in a limited period of time. Another high benefit is the networking element of the training." "Intense, great teacher, great facilities at Wyboston lakes, great experience." "Absolutely super competent trainer. Extremely intense but worth while." "Good focused Course Material with knowledgeable, experienced as well as forthcoming Instructor. Facility is just the right kind of environment for such course. discussions and insights from Trainer, Course participants representing varied backgrounds and industry made it a great learning experience. " "Instructor is well aware of the topics and an expert. He encourages interaction which improves the learning experience. " "Great way to learn in isolation, away from daily routine, excellent method used to transfer knowledge." "The Firebrand Black Belt course was intense and far exceeded my expectations. I learned the practical application of the tools and techniques in the real world through exercises and case study. If you want more than just a certification and want to learn HOW to apply the knowledge and skills to improve your Company... then go with Firebrand!" "The training is very good and easy to understand. It's a mix of practical & theory work. the examples and method of teaching is very closely related to my daily routine work which makes it easy to apply in my daily life. " "Excellent value for time and money"
"Awesome course, this is my second course with Firebrand and I'm sure it won't be my last! " "Class is good, training materials are good, instructor is excellent." "Excellent Training delivered in a Six Sigma excellence way"
"Really enjoyed the course. The instructor was very professional and proficient in the subject and in teaching it." "The training content and approach was very good. It made learning easy with the relevant case studies and a lot of practical application tips. The trainer was also very well rounded with a wealth of experience which he brings to bear during the course." "Firebrand team were very detailed in giving information about the courses and outcomes' expectation. The program was fully organised and monitored. The course itself was a great experience and I couldn't have imagined it better; it exceeded my expectations."